Manila, Daggett County - Several agencies are asking for the public&apos;s help in improving the health of the Flaming Gorge Reservoir fishery. The most beneficial step anglers can take is to keep the small lake trout they catch. Currently, the popular reservoir in northeastern Utah - known for producing some of the largest lake trout in the country - has too many small lake trout in it. 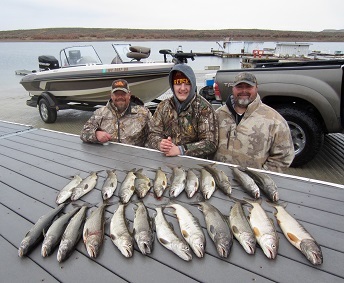 In Flaming Gorge, lake trout larger than 25 inches mainly consume kokanee salmon and rainbow trout. If the abundant population of smaller lake trout (under 25 inches) is not reduced, there could be impacts on the salmon and rainbow trout populations, as well as fewer fish to feed the trophy lake trout. Ryan Mosley, the Utah Division of Wildlife Resources&apos; lead fisheries biologist at Flaming Gorge, says growth rates for lake trout have diminished in the reservoir since the 1990s. "In the 1990s, an 8-year-old lake trout was about 30 inches long," Mosley said. "Today, an 8-year-old fish is about 23 inches long. On top of the decreased length, the number of lake trout in the reservoir has increased dramatically in the last couple of years, and we&apos;re concerned the situation is going to get worse." "Many anglers don&apos;t realize the smaller lake trout are quite tasty," Mosley said. "They&apos;re one of my favorite fish to eat. In Flaming Gorge, only kokanee salmon rival them in taste." "Anglers are fundamental to helping control the number of lake trout in the reservoir," Mosley said. "Many anglers don&apos;t fish the Gorge&apos;s open water this time of year, so there&apos;s very little fishing pressure. It&apos;s a great time to get out and target these smaller fish." "We hope efforts like this derby also serve as an educational opportunity to address the biologists&apos; growing concerns," Mosley said. "Anglers can help the Flaming Gorge fishery by harvesting these small lake trout."